Allens Taxis is one of Coventry’s most established businesses and Allens is synonymous to taxis to the people of Coventry. 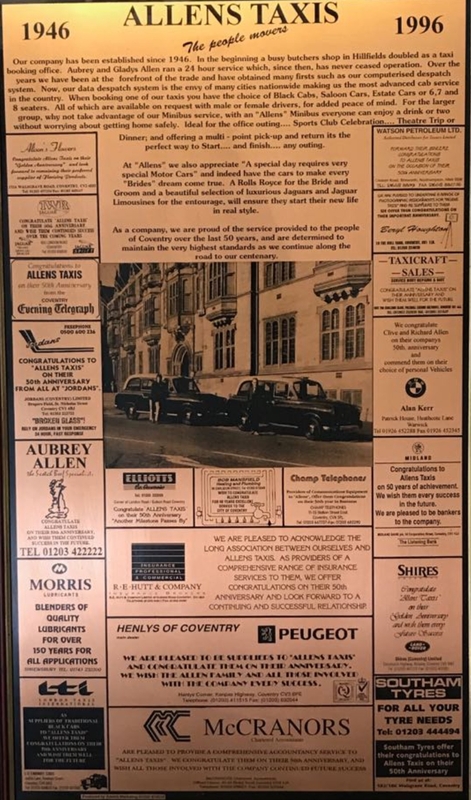 Allens taxis has been moving the people of Coventry since 1938 when it was originally founded by Aubrey Allen. It did not run during WW11 but reopened in 1946 when Mr Allen bought a taxi with his demob money as a sideline to his butcher shop. Coventry Arena Taxi and Transport Services Ltd was established in 2005. 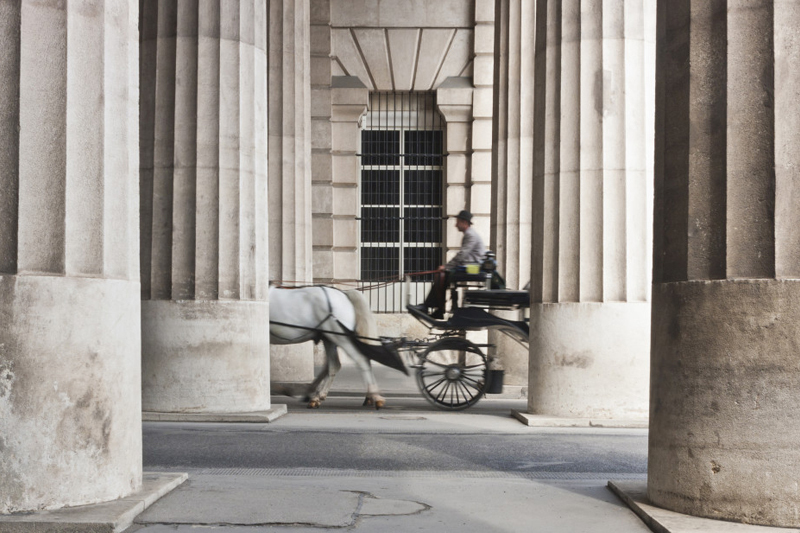 Arena purchased Godiva Taxis in 2006 and Allens Taxis from the Allens Family in 2011. 2018 sees our most recent addition to the family Trinty St Taxis, another giant of the taxi trade. Since 2005 Arena has grown year on year. We have done this by consistently ensuring we maintain good customer service with a willingness to innovate. Owners Paddy & Susan are ‘Coventry Kids’ born and bred and proud to own such an iconic business. Paddy’s Dad was a Coventry Cabbie for over 30 years and drove for Allens taxis, he was always proud of his profession and was an ‘old school’ cabbie back when, before deregulation, there was never any more than 99 black cabs allowed in the whole city. The industry has changed dramatically over the last few years, with the introduction of G.P.S tracking, Sat Navs, I.V.R, web bookings and apps. Allens Taxis has an established reputation built up over ¾ of a century by these ‘old school cabbies’ and despite these huge changes we continue to run it as a family business with, at its core, traditional values of integrity, courtesy and good service. We value our loyal customer base and have customers in their 90’s that have only ever used Allens Taxis. They often tell our operators stories of being transported on their wedding days’ or from the hospital after births. Allens has been a part of many special moments for the people of Coventry. Due to our reputation, we are also the company of choice for celebrities visiting Coventry, from comedians, stage actors and film stars. We’ve transported a couple of ‘007’s’ and many Premier League football players. We don’t hassle customers for photographs and respect their privacy but we do wish we had a photo of two star passengers from back in the day, Oliver Hardy and Charlie Chaplain in an Allens Taxi, that would be something to share. We know that it is important to our loyal customers to have real, local people in a real, local office answering their calls, not an algorithm in cyber land. When you need a taxi urgently or have left your bag in the back of a cab, you want to be able to speak to someone who will empathise and be able to help you immediately, we get this, but we also know many of our younger customers want the convenience of an app, with all their details stored and predicted journeys ready. They want to order a taxi with a few clicks on their phone. Allens delivers the best of both worlds. The security of the familiar with the convenience of the new.